The facet joints are small stabilizing joints in the spine, located behind and under vertebrae. They allow movement and twisting of the spine near the neck and lower back, but not too much or we’d look like one of those inflatable things outside car dealers, flopping all over the place with no stability. 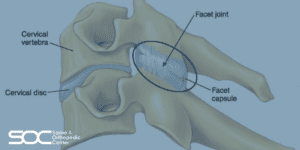 Inside the face of each facet joint is a low friction pad made from moist cartilage. Each joint is then surrounded by a capsule full of its own supply of lubrication keeping those cartilage pads moist. In addition, nerve fibers sit in the capsule informing the brain of any problems, we typically feel this signal as pain. Since these joints are almost in constant motion, helping keep us upright, they can experience a lot of abuse and may become worn-out. This degradation of the pads and bone can lead to bone spurs, facet joint enlargement and inflammation, this is known as facet joint disease. Facet joint syndrome can be caused by a combination of aging, pressure overload of your facet joints, and/or injury. Pressure overload on your facet joints is probably caused by degeneration of the intervertebral discs in your spine. As the discs degenerate, they wear down and begin to collapse.